The ReStore is seeking regular volunteers, and we have a place for everyone! These are just a few of the things our volunteers do to run our store: help with donation pickups, unloading trucks, stocking shelves, pricing inventory, assisting customers, cleaning and organizing the store. Through the generous contribution of your time, energy, and talents you help keep our overhead low so that we can contribute more towards building Habitat for Humanity homes in our local community. 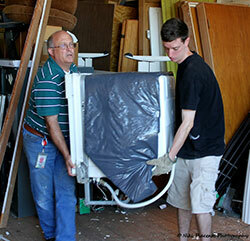 ReStore Delivery VolunteersHelp our customers by picking up donations or delivering merchandise from the ReStore. ReStore Loading Dock VolunteersHelp ReStore customers load purchases into their vehicles, unload donations to store inventory. ReStore Sales Support VolunteersPrice items, stock shelves and display merchandise, help customers find and select items, and maintain the ReStore’s appearance. ReStore Lead VolunteersPlay an integral role in the ReStore by actively greeting and helping customers, assuming responsibility for a department within the store, and mentoring other volunteers.